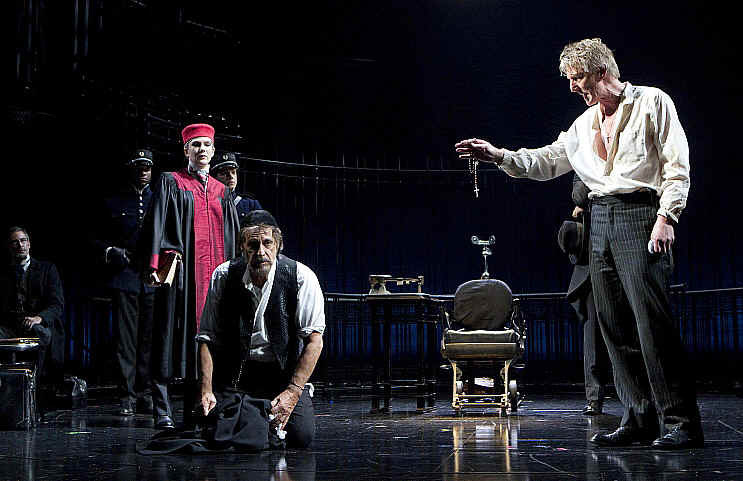 Daniel Sullivan’s production of “The Merchant of Venice,” which began at the Delacorte Theatre in Central Park last summer and has just re-opened on Broadway, is a deep and upsetting rendition of one of Shakespeare’s darkest comedies. Library shelves groan with dozens of tomes dissecting and debating this one play, none of which I’ve read. Like most people who are not Shakespearean scholars, I tend to recall “Merchant” as the one about the Jewish moneylender Shylock who seeks his revenge on anti-Semitic Venetian society by demanding an agreed-upon “pound of flesh” from someone who’s defaulted on a loan and is foiled through the heroic intercession of one Portia, who teaches that “The quality of mercy is not strained.” Most productions are remembered for the major star performance in the role of Shylock. “The Merchant of Venice” was last seen on Broadway in 1989 when Dustin Hoffman played Shylock, and no one talks about who played Portia. In this production, the Shylock story is only part of an intensely detailed examination of the cruelty and capriciousness that drive all kinds of bonds between human beings. And although Al Pacino rightly receives above-the-title billing for his well-wrought Shylock, no one who sees it will forget that he was equally met and matched by Lily Rabe, the young actress who gives a star-making performance as Portia. Mark Wendland’s ingenious black-steel set instantly establishes the world of the play. It’s a combination cage and castle in which love and money are heavily traded commodities. Inside the cage, businessmen in suits circle an altar of ticker-tape; outside the cage, men in yarmulkes and peyot interact with guilty furtive customers, as if some drug deal is going down in a shady alley. A scene already dense with commentary (on the Christian prohibition against usury and the hypocritical condemnation of and dependence on Jewish bankers) receives another layer of meaning today – we are meant, I think, to connect the sleazy underbelly of banking history to the Rube Goldberg-like subprime mortgage crisis that brought the American economy to the brink of disaster. All of this is embedded in Shakespeare’s text, of course, and shows up in almost every production of “The Merchant of Venice.” But Sullivan’s subtle yet pointed staging made me unusually aware of the numerous contractual agreements in the play and how each of them comes loaded with some element of whimsy, perversity or downright cruelty. The scene where Shylock gets his day of reckoning could be considered the climax of the play, followed by some light-hearted comic business. But in this production, that tense scene launches an increasingly sickening series of humiliations, and nobody gets off the hook. Harbour’s Bassanio understandably stands by Antonio when it comes time for Shylock to exact his terrible revenge. It’s left up to us to wonder how an honorable gentleman can defend the kind of vicious Jew-baiting that Antonio has exhibited. The answer must be that everybody does it – and we watch in horror as Shylock not only loses his day in court but is forced to undergo a forced baptism that looks for all the world like waterboarding. The mystery deepens when Portia, having donned a lawyer’s frock to argue Antonio’s case before the Venetian court, suddenly decides to demand that Bassanio back up his expressions of gratitude by handing over the wedding ring that she had made him promise never to surrender. What is in her mind? What impossible bargain is she forcing Bassanio to strike? She becomes the shadow Shylock, acting on some primordial instinct for revenge against…what? Her father and the men who blithely agree to view her as a commodity to be traded on the stock exchange? Meanwhile, her parallel princess Jessica has to live with the experience of watching her father publicly tortured and the knowledge of her complicity in the situation. The show ends with the unexpected tableau of these two women alone onstage, silent for a long time, Portia on her balcony, Jessica dropping into the pool the legal document entitling her to half her father’s estate. If I have any quibbles, they are more with Shakespeare than with this production. The quality of mercy may not be strained, but my credulity certainly was by the scene where Bassanio looks the disguised Portia right in the face and doesn’t recognize her, especially considering all the snogging we’ve watched them doing on the spiral staircase even before Bassanio picked the right box. And it may be idiotic to complain about plot contrivances – we’re talking about Shakespeare, after all! – but it’s a little creaky for Antonio’s ships to sink when it’s convenient for the story and for them to sail into harbor intact when that’s convenient. It is a tribute to the production that you’re drawn into every one of the several plotlines and never tempted to tune out or doze off. The placement of the set also means that most of the actors end up delivering a good number of their lines right down front (in what opera directors call “park and bark” position), which helps modern audiences pay attention to the intricate language. But mostly, the tremendous impact of the production can be attributed to the exceptionally fine ensemble cast, who match Pacino and Rabe in their uncommon commitment, intelligence, and willingness to inhabit sometimes mysterious human behavior. Besides Jennings, Harbour, and Fitzgerald, I would single out Peter Francis James (as Antonio’s friend Salerio), Jesse L. Martin (as Bassanio’s rowdy sidekick Gratiano), and Gerry Bamman (whose Duke of Venice disconcertingly sounded at times like Tim Gunn of “Project Runway”) as best among equals. I would say that no one needs to be informed of Pacino’s greatness, except that I’ve seen him give stage performances where he wasn’t exactly occupying the same universe as his fellow actors, and he has phoned his mannerisms in to any number of mediocre movies over the years. But as he did playing Roy Cohn in Mike Nichols’ film version of “Angels in America,” Pacino stays completely present and unpredictably alive with Shylock, giving an entirely different reading of the character than he did in the 2004 movie opposite Jeremy Irons. And what can be said about Lily Rabe? She’s not yet 30, she’s an unusual beauty, a little younger and yet more solid than you might picture Portia. But she, too, plays each scene for itself, never settling for some average or generic depiction. She doesn’t play entitlement, but she exudes it. She is affectionate with Bassanio and yet her behavior at the end is ultimately enigmatic in a way that lets us imagine the rocky roads ahead in that marriage. She doesn’t play Portia as heroic but as human. I’ve admired some of Daniel Sullivan’s productions in the past – the New York premiere of Lynn Nottage’s “Intimate Apparel” starring Viola Davis was one of the most memorable productions of the last ten years – but I mostly think of him as the go-to guy for middlebrow dramas that don’t interest me, like “Proof” (yawn) or “Time Stands Still” (currently on Broadway). I didn’t see his acclaimed production of “Twelfth Night” in Central Park the summer of 2009, which starred Anne Hathaway, but this thoughtful, iconoclastic staging of “The Merchant of Venice” makes me understand his status as an A-List director. It’s right up there with the recent revivals of “Mary Stuart” and “Exit the King” on Broadway – meaty classics that feed theatergoers looking for something more than entertainment.